It was a week before Christmas, 2014 and Chris Seisay didn’t have a worry in the world. The redshirt freshman was a backup defensive back on arguably the greatest football team in University of Oregon history. The Ducks were coming off a 51-13 thrashing of Arizona in the Pac-12 Championship at Levi’s Stadium to cap off a 12-1 regular season. In a matter of days, he and his teammates would be heading down to Beverly Hills to prepare for the Rose Bowl on New Year’s Day. The two men he was backing up, both seniors, were surefire NFL draft picks. Marcus Mariota was at quarterback. Oregon was favored in Vegas. Seemingly nothing could go wrong. At the time, you couldn’t blame head coach Mark Helfrich and his staff for reaching for the panic button with Ekpre-Olomu rolling in pain on the Eugene practice turf. The injury to the star who had led the Oregon defense all year instantly created a gaping hole in the Ducks’ secondary that needed immediate filling. Especially with a defending Heisman Trophy winner looming on the other side of the ball in Florida State’s Jameis Winston. A quarterback who had never lost in college up to that point. An unblemished 26-0 as a starter. “Next thing you know, like a day after the news broke of the injury, I start getting blown up on Twitter and Instagram by all kinds of Florida State fans. People coming out of nowhere telling me I was gonna get torched by Jameis. How I had no shot. I had to delete my social media for two weeks,” explained Seisay with his customary smile. Drawing on the guidance of his senior wingman Troy Hill, who is now with the LA Rams, Seisay and the Ducks wound up holding Winston and Florida State to just 20 points in a 39-point triumph over the Seminoles. Oregon would force five turnovers on the evening, snapping FSU’s 26-game win streak and sending the Ducks to their second national title game in school history. Seisay was not only ready, but he shined. He was a legitimate shut-down corner now. Nobody stopped Jameis Winston in college. Until he and the Ducks managed to lock him down in Pasadena. Eleven days later, Oregon would face Urban Meyer and Ohio State at Jerry’s World in Dallas for the National Title. Seisay tallied seven tackles on the night, but it wasn’t enough. Not with Ezekiel Elliott rumbling for four touchdowns on the ground. The Buckeyes won the first playoff title in college football, but the future couldn’t have been any brighter for Seisay. He had arrived on the biggest stage in college football and delivered, twice. Long before Seisay ever arrived on football’s national stage in a loud green Oregon Duck jersey, he showed up in American Canyon, California during elementary school, by way of bordering city Vallejo. Before 1992, American Canyon hadn’t been incorporated as a city yet. They wouldn’t even have a high school built until 2010. When he moved into town, Seisay essentially had no idea where he’d end up for high school, but that didn’t stop him from falling in love with the game of football at a young age. As a fifth grader, Seisay was an unstoppable force on the blacktops of American Canyon, linking up for touchdown after touchdown with his buddies. “This was before Snapchat, so yeah, we just played outside all the time to be honest,” he says. By the time he entered middle school, a local Pop Warner team, the American Canyon Patriots, were recruiting him hard to come play wide receiver. Even reserving Jerry Rice’s #80 for him. Whatever would help convince his mom to let him put on the pads. Finally, it worked, and within a year, Seisay was hooked. By 8th grade, he followed his friend Chad Miller to the Vallejo Generals Pop Warner program and created a duo that had both towns buzzing. Miller, who now plays for San Jose State, made Seisay his favorite target, riding him all the way to a national tournament in Las Vegas. By this time, every high school coach in the greater North Bay yearned for Seisay’s athleticism, knowing his hometown hadn’t built him a high school yet. After starring as a two-way player on Vintage’s JV squad, American Canyon High School was finally finished. His mother Princess, still lukewarm on the whole idea of tackle football, insisted he stay close to home. Seisay hated the idea, but obeyed her wishes anyway. With only freshman and sophomores enrolled on the brand-new campus, American Canyon only could field a JV team that year, and MacMillan was the head man. Seisay was an instant star and immediately hit it off with his new coach/math teacher. Teams like Vallejo, Fairfield and Benicia figured to dominate them, but somehow that wasn’t the case. American Canyon was competitive right away. Coach Mac made sure of it. As a junior, Seisay led a team devoid of any seniors to wins over Piedmont and Vallejo. The next year, Seisay led the school’s first graduating class to a record of 11-2, including two playoff victories. Seisay was a force on both sides of the ball, recording 92 tackles on defense and 11 touchdowns as a wide receiver. Coach Mac relentlessly sent out highlight videos of his senior star to the biggest programs in college football. Almost everyone liked what they saw. And after turning heads at a camp in Idaho in front of head coach Chris Peterson, Boise is where he thought he was headed to play in real life. That is until he stepped foot on campus at the U of O. When Chip Kelly calls, you listen, regardless of what team you grew up playing video games with. In his first year at Oregon in 2009, Kelly immediately took the Ducks to the Rose Bowl. The next year, he had them in the national title game versus Auburn. Then in 2011 Oregon won the Rose Bowl and finally in 2012 they won the Fiesta Bowl. Oregon was literally a machine at that point and they were asking Seisay to help anchor their defense. He couldn’t say no. Upon his arrival, however, Seisay would find himself with more unexpected change in his life. Chip Kelly took the Philadelphia Eagles job, leaving Mark Helfrich in his place. Even with Kelly gone, the Ducks were destined for success with Hawaiian wonder-kid Mariota under center, leading them to the national title game, while winning the Heisman. The post-Mariota Era was not so kind, however. Seisay remembers the night in East Lansing, Michigan all too well. With a new quarterback at the helm for Oregon, it was up to a young Duck defense to hold down Connor Cook’s Michigan State offense in a hostile road environment. Toward the end of the first half, Seisay went in for a tackle. When he came out of the play, he felt something tear in his left ankle. 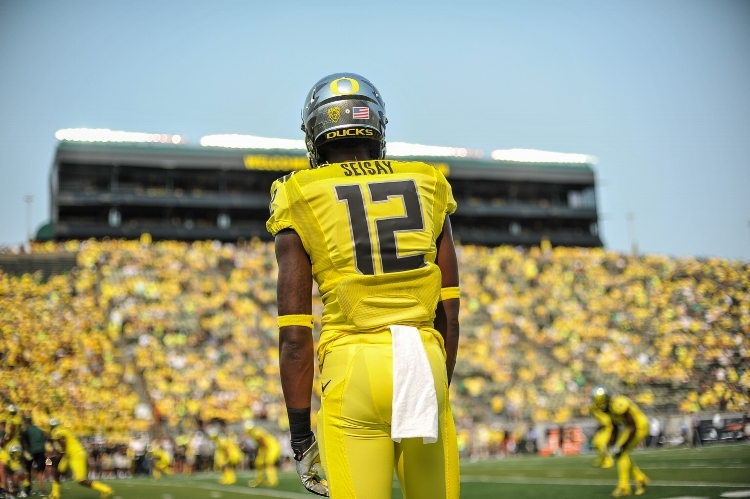 Without Seisay in the Ducks’ secondary, Oregon went on to lose by three points. A chance at a repeat trip to the national title was all but lost. Seisay was devastated. For the next eight games, he watched from the sidelines, nursing an ankle that was slow to heal. The secondary he was supposed to be mentoring from the field was left to struggle, mired in silly mistakes due to inexperience. The Oregon staff kept asking if he was ready, but this time he wasn’t. At least not soon enough. By the time Seisay fully returned to health, the Ducks found themselves in the Alamo Bowl against TCU. At half, Oregon was up 31-0. Then the nightmare started. TCU had nine possessions in the second half, and they scored on every single one, eventually beating Oregon in overtime. The bad taste of the season stuck with Seisay throughout the spring and into the summer. Eventually, he decided he needed a change of scenery and longed to return to his boyhood position at wide receiver, so he went for it. Of course, the unexpected always seems to follow Seisay’s football career, and this endeavor proved no different. After two games on offense, a slew of team injuries forced Seisay to accept a role back on the Portland State defense. He happily obliged, leading a secondary that proved to be a bright spot in an otherwise gloomy 3-8 season. The following year was an even tougher road for the Vikings. After two close losses to BYU and Oregon State where Seisay shined, the wheels fell off completely, as the program wound up going winless last year. Since graduating from Portland State with a Social Science degree in the winter, Seisay has been back in the Bay Area training for the next step in his football career: the NFL. He doesn’t seem the least bit intimidated by the challenge. 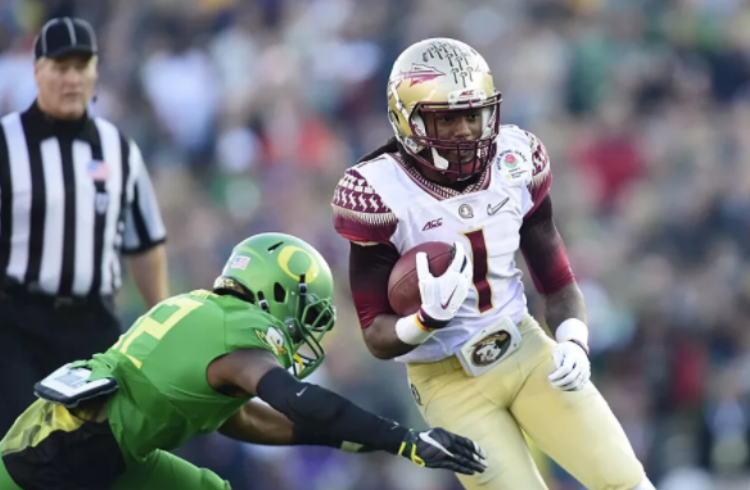 For the past four years he’s run in the same circles of all the top rated defensive backs on this year’s draft board including Derwin James of Florida State, Isaiah Oliver of Colorado and Denzel Ward of Ohio State. Looking at these guys on tape and evaluating their combine numbers, it’s hard to tell the difference between them and Seisay. With a 4.4 40-time and a 38 inch vertical, he’s every bit as athletic as your typical NFL defensive back. And at 6’1”, it wouldn’t be a stretch to compare him to some of the taller corners around the league such as recently introduced 49er Richard Sherman. On April 12th, Seisay was in Alameda at the Oakland Raiders’ practice facility working out for Jon Gruden. Sources close to the Silver & Black reported that Chuckie was impressed. And if he’s looking for recent Portland State success stories, he doesn’t have to look any further than DeShawn Shead of the Lions and Xavier Coleman on the Jets, both of which recently came out of the Vikings’ program. “To be honest, I’m not really worried about what is going to happen on draft night. I’ve put up good stats for four years and played against a lot of NFL caliber quarterbacks. I’m comfortable with what I did on my pro day. I have faith that I’ll get my shot. Then it’s up to me to run with it,” says Seisay. If and when Seisay gets his name called by an NFL team, he’ll have the whole city of American Canyon rooting for him, including an unknown high school that he helped get off the ground. By the time I wrap up my discussion with Seisay in American Canyon, we’ve been interrupted twice by well-wishers, members of the community that couldn’t help but stop over to say hello to the Chris they’ve watched grow up and since followed on national television. “See man, there’s support in this city,” says Seisay as he continues our debate of the relative merits of Vallejo legends such as Mac Dre, E-40 and CC Sabathia. “You gonna make it?” asks one particular passerby. “Man I hope so,” responds a smiling Seisay.